I sort of knew what I was searching for and sort of didn’t. 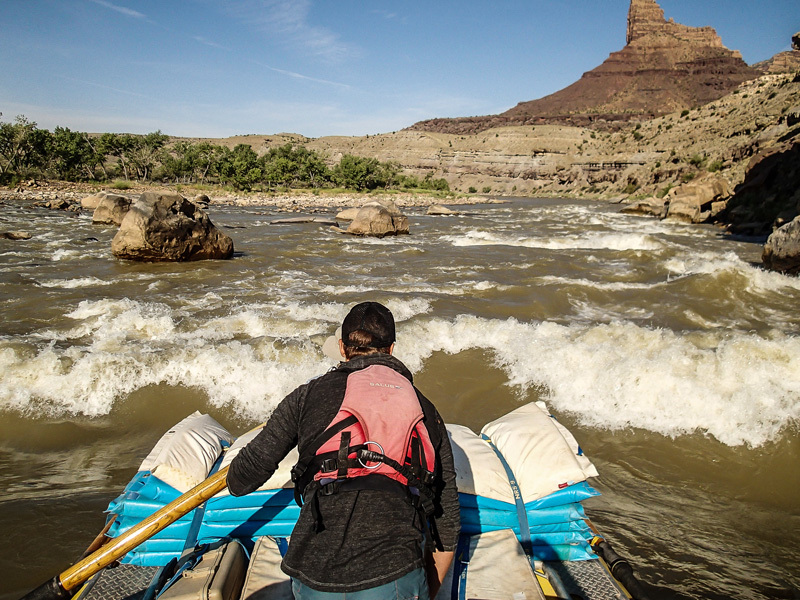 After rowing around a bend in the Green River, Rock House Canyon opened dramatically ahead. I tied my raft to shore and walked up a dry creek bed. Above rose buttes and fins of orange-brown rock, part of the Green River Formation. This geologic unit is comprised of crumbly shales and sandstones which were deposited millions of years ago when the region was flooded by the long-gone Lake Uinta. The cliff faces shone brightly in the morning sun of early August. Somewhere near here was a Fremont Culture petroglyph panel—but I didn’t have any specifics about size, subject matter, or precise location. Also, based on the fresh claw prints in the beachside mud, there might be a nearby bear who shared my interest in rock art and amateur archaeology. As I squinted at cliffs on the north side of the wash, a red-tail hawk soared overhead. Rounding a corner, I entered a narrow space between brush and stone. At my feet were over a dozen round piles of bear poop. I practically jumped back out of this slot, my head spinning. And there were the petroglyphs! How convenient. I traced a herd of bighorn sheep that was etched into sandstone hundreds of years ago. Not much is certain about the mysterious Fremont people. 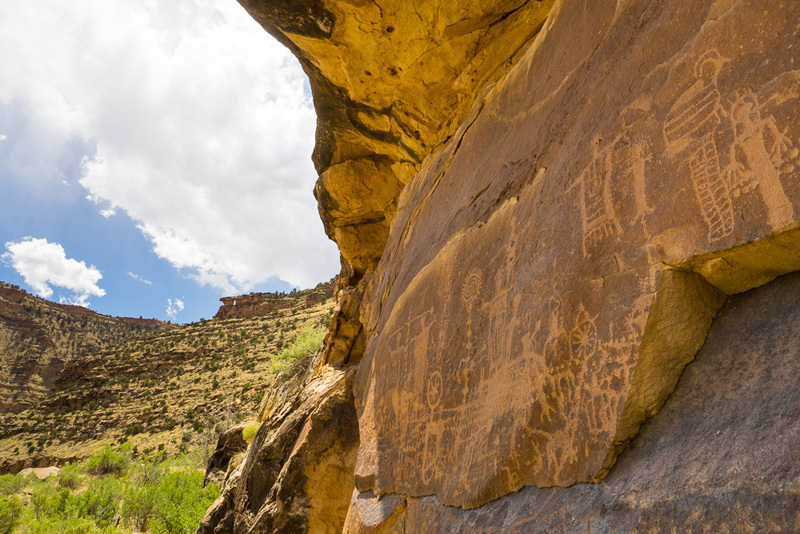 They were an ancient culture of native American hunter gatherers that ranged across the northern two-thirds of Utah, roughly between the years 600 and 1300 A.D. 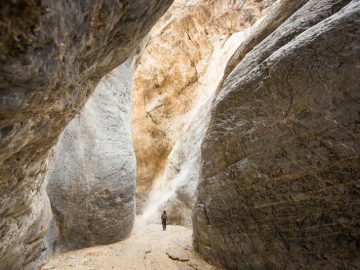 Sometime around 900, they occupied Desolation Canyon and farmed the river bottom, built granaries, and created amazing rock art panels. The archaeological evidence points to a chaotic time—including hard-to-reach and hidden structures, artwork depicting war imagery, and some burial evidence of cannibalism. Within 300 years, the Fremont had vanished, and the canyon remained mostly uninhabited for hundreds of years. Today, the remains of many Fremont sites can still be visited. Continuing downstream, eventually I passed Lighthouse Rock, a feature made topographically famous (that’s a thing, right?) by photographs from the second Powell expedition. Before that time, a few white fur trappers passed through during the early 19th century, including the mysterious Denis Julien who seems to have left his initials on a boulder in Chandler Canyon. 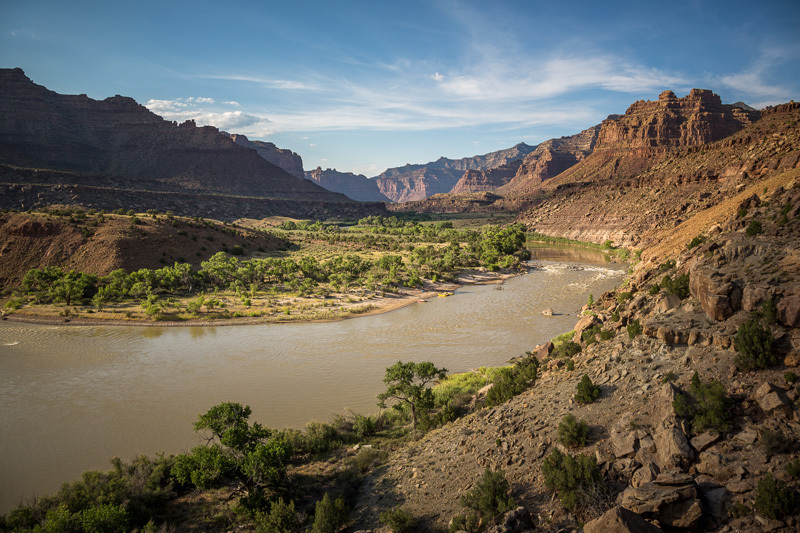 But it wasn’t until 1869, when John Wesley Powell and crew became the first American explorers to row boats through the canyon, that it was named. 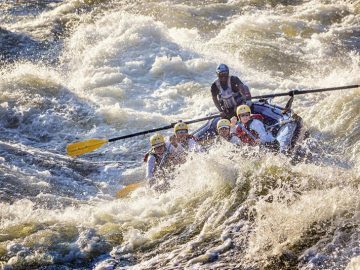 Since that time, many river runners have taken issue with their word choice. Sure, upper Deso seems appropriately named, given that above Lighthouse Rock it’s a slow-moving affair through a stark but scenic landscape. But not far below Lighthouse Rock, the river speeds up with many Class II-III rapids and enters a beautiful gorge with stair-stepping red sandstone walls lined by scrubby junipers. As a result, inner Deso looks anything but desolate. For my second night I camped at Jack Creek, from where I could see this gradual transition as I hiked to nearby Mushroom Rock to view more Fremont artwork. This latest set of pictographs piqued my interest about what’s to come as I rowed through the confines of inner Deso. At Flat Canyon, I stopped to view the most impressive Fremont rock art panel I’d ever seen—OK, now you’re just showing off, Fremont artists. Far more than bighorn sheep, this one had peculiar shapes and patterns. Curious human figures in headdresses. Back on the river, I floated around a corner and drifted swiftly past one favorite subject of those artists. 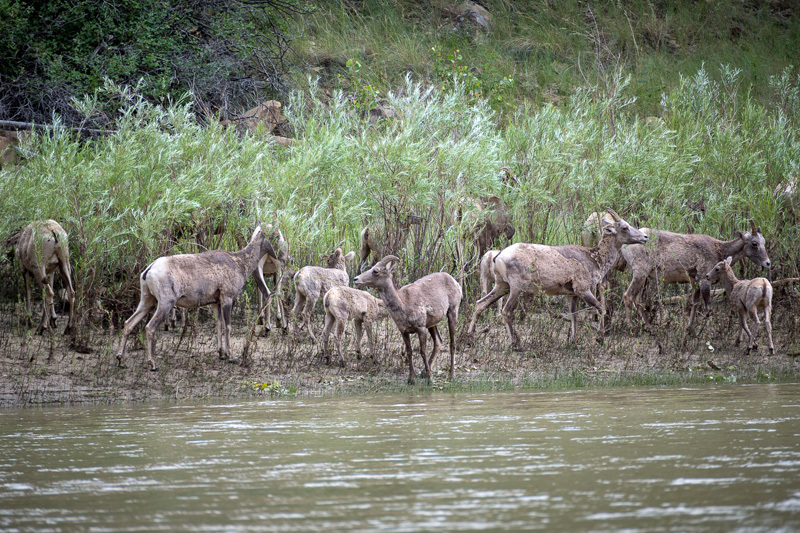 A large herd of real-life bighorn sheep grazed lazily by the river. I glanced up at them, they glanced up at me. I realized what I was seeing, they realized what they were seeing. And then they ran as a flock across the dunes and up a mountain. While this was my most exciting wildlife encounter of the trip, it was just one of many during my week in this wilderness. Beavers crossed the river ahead of my raft. Frogs visited me on shore. The next day, I even stumbled—literally, I almost sprained my ankle I was so surprised—across a praying mantis devouring a small lizard. 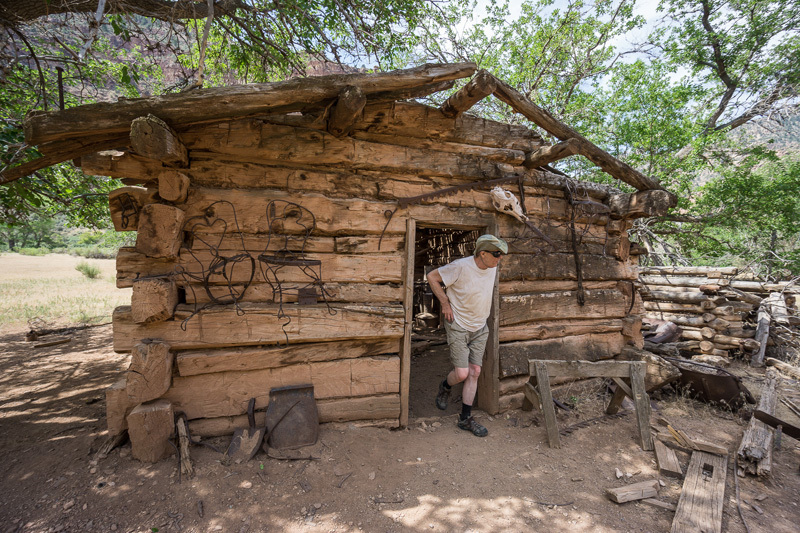 This happened at Rock Creek, one of the few sites in the canyon to be occupied long-term by white homesteaders. After Powell’s trip, the recently-completed transcontinental railroad brought prospectors, settlers, and cowboys driving cattle across the West. Tucked into the eroded core of the Tavaputs Plateau, the rugged Deso region was late to be grazed. But its wide vegetated bottomlands were ideal for cattle, which eventually brought the herds as other prime areas were depleted. Only a few sites were suitable for ranches—and only a few families ever occupied them. One such spot was at Rock Creek Ranch, where a few log and stone structures were erected by the Seamount family and still stand. 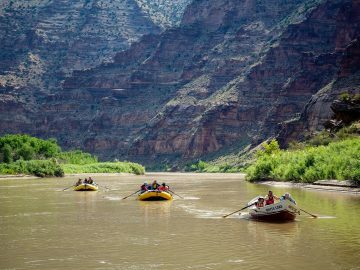 My fifth day in the canyon, I rowed out from the dramatic cliffs of inner Deso’s Colton Formation and entered Gray Canyon. The landscape here is a bit more like upper Deso than inner, but with a bonus. Plenty of wide, but sporty, Class II-III rapids are encountered during the final 25 miles of the trip. At Coal Creek, I explored the few structures related to an old dam site. Around 1907, a private company began surveying and drilling bedrock. By 1913, the project went bankrupt. But the idea of damming Desolation Canyon returned in the 1920s with the formation of the Bureau of Reclamation (BLM). In the end, the crumbly rocks and remote location of the canyon meant the bureau turned elsewhere for its water projects. Centuries after the Fremont vanished, and decades after the last homesteaders packed up and left, concerns about future development remain. Most fears relate to expanding oil and gas extraction on both public and Ute lands. For decades, nearly 300,000 acres along the river corridor have been designated as a Wilderness Study Area by the BLM. In the meantime, the study area is being managed as such given its natural and historic qualities. On my sixth and final day, I rowed toward the take-out at Swaseys Beach. 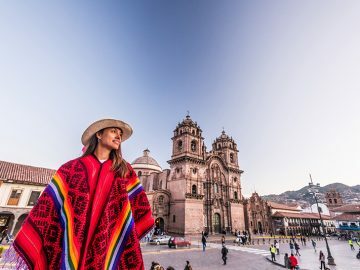 I was grateful for a fresh eyes visit to Deso and decided I’d definitely return. 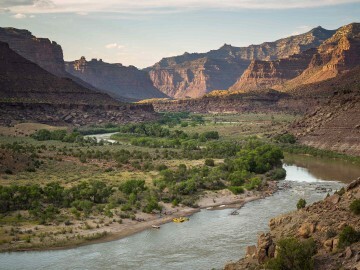 Running the Green River through Desolation Canyon is like a trip through time in the heart of the American Southwest. A place that hopefully will remain preserved for Americans to explore for generations to come. 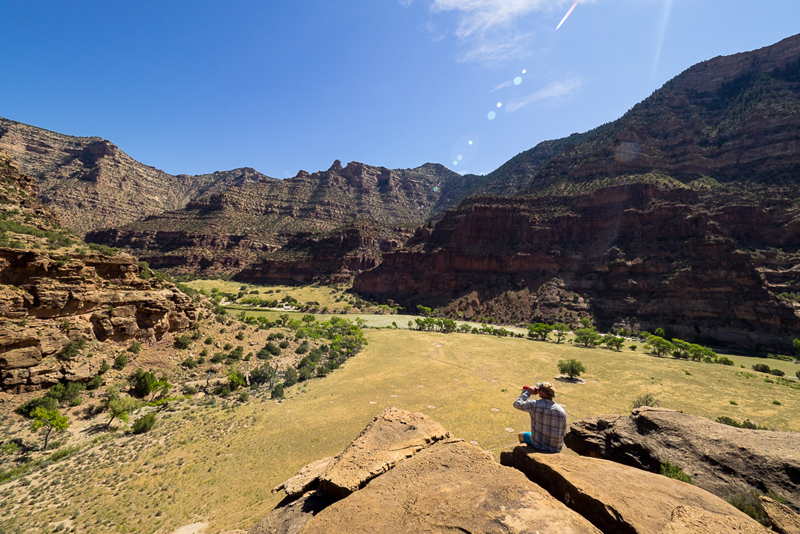 UPDATE: In March 2019, the John D. Dingell, Jr. Conservation, Management, and Recreation Act, which included protections for parts of Desolation and Gray Canyons, was signed into law. Of the combined 110 river miles in both canyons, 14 miles of the Green River in Gray Canyon were added to the Wild & Scenic Rivers System. Specifically, the 5.3 miles of river from Coal Creek to Nefertiti access were designated as wild and the remaining mileage designated as recreational. Also, a new Desolation Canyon Wilderness was created, including approximately 143,000 acres extending west from the river-right shore between Chandler Canyon and Gunnison Butte. Mike Bezemek is the author of four books, including Paddling the John Wesley Powell Route & Paddling the Ozarks. 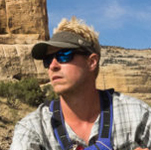 He’s also a contributing editor for Canoe & Kayak Magazine and contributes regularly to a number of publications.